UK space policy faces a major revamp with civil servants being moved out of London and stripped of some of their responsibilities. 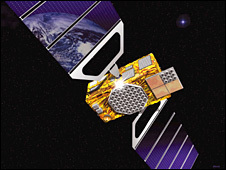 The British National Space Centre (BNSC) was set up to co-ordinate civil space activities across government. The BBC has learned that staff will be moved to Swindon to sit with the agencies that fund UK space science. BNSC will also lose some industrial duties to an agency tasked with fostering innovation in the UK economy. A spokesperson for the Department for Innovation, Universities and Skills (DIUS) said the move to Swindon would "bring organisational and programmatic benefits". He commented: "This decision is in line with the Lyons review to de-centralise public sector activities outside London. "As part of the move, the government is proposing to transfer some areas of management and funding of current DIUS-funded space programmes to the Technology Strategy Board." Originally an advisory body in the old Department for Trade and Industry (DTI), the Technology Strategy Board (TSB) now operates at "arm's length" from government. One of its principal aims is to boost knowledge transfer between universities and businesses. It is understood that the BNSC will retain its responsibilities co-ordinating other areas of civil space. The BNSC came in for robust criticism last year in a report by the House of Commons Science and Technology Committee. The committee said the centre lacked leadership and co-ordination; a low profile and poor resources contributed to the problems. The BNSC has also come under fire from the UK academy of science, the Royal Society. In a recent consultation exercise, it said the centre had neither the power nor the funds to implement an effective space policy. The Royal Society has called for the BNSC to be replaced by a fully fledged UK space agency. Bill Hartnett, a spokesperson for the Royal Society, commented: "This falls a long way short of a UK space agency. There need to be fundamental changes and this seems to be more about tinkering at the edges than anything else." He added that the overall UK space budget was low, but there were aspects of space that the UK did extremely well. Britain needed to make more of these, Mr Hartnett explained, both on the international stage and in terms of working with industry. The UK civil space budget is about £220m, some two-thirds of which is spent on projects through the European Space Agency (Esa). About 40% of this spend is channelled by the Science & Technology Facilities Council (STFC), one of DIUS' funding agencies. The BNSC launched a new civil space strategy in February, along with a formal review into whether British astronauts should take part in the international exploration of space.